At the junction of the two substrates vertical movement can likely occur. Even the smallest amount can cause tiles, (especially those of natural material), to crack at this point. CI+ matting cannot absorb this movement. Even over boarding both surfaces would not be guaranteed to remove this risk. Some clients find the idea of a movement joint at this point less than ideal. 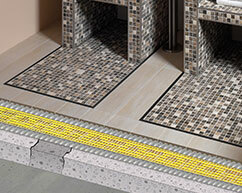 We can offer help to reduce impact by providing a colour co ordinated movement joint to match either the tiled surface or grout lines. 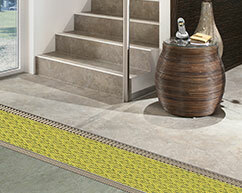 (Minimum order 1 x 2.5mtr length). 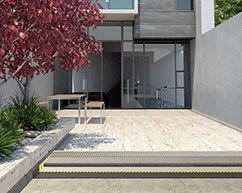 At these points CI matting should be split directly at the joint and a surface movement joint positioned directly in line above the subfloor / CI matting split. 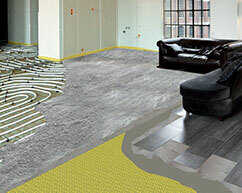 If no subfloor joints exist, then intermediate joints should be fitted at no more than 10mtr x 10mtr field size. 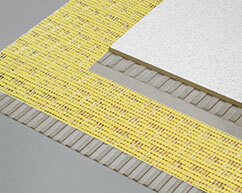 CI Matting absorbs horizontal movement very effectively.